Comarch Digital Insurance is a front-office solution ensures digitalization of sales and service processes with real omnichannel customer experience. It provides integrated applications for different users based on one common business logic engine. 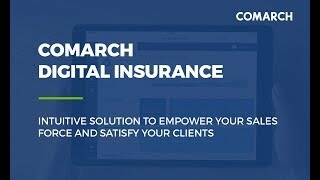 Comarch Digital Insurance is a comprehensive solution dedicated to both insurance distributors and insurance end-clients. The end-client functionality allows smooth direct purchase of covers and management of policies in a portal without insurer’s assistance. The client portal also provides dedicated features for group insurance affiliates and group policy administrators. Comarch Digital Insurance gives insurers a strong competitive advantage - the success key is high usability and functionality adjusted to the real business needs of particular user groups and individual requirements. Short time-to-market ‒ smart product definition &parametrization for constant business development.